Paul Mascarenas retired Oct. 1 after 32 years at Ford. Retired Ford executive Paul Mascarenas has joined ON Semiconductor Corp.’s board of directors. Mascarenas, 53, also joined the semiconductor supplier’s science and technology committee, the company said. 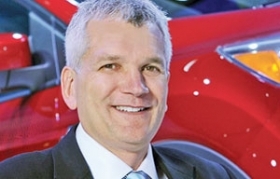 He is an “outstanding addition” to the board, bringing automotive industry experience from his leadership and strategic planning positions at Ford, Dan McCranie, chairman of ON Semiconductor’s board of directors, said in a statement. “Automotive electronics remains a primary focus for ON Semiconductor, currently accounting for approximately 30 percent of annual revenues,” McCranie said. Mascarenas retired Oct. 1 after 32 years at Ford. He had been chief technical officer since 2011. He was replaced by former Lockheed executive Ken Washington. Mascarenas played a major role in product development and advanced technology at Ford, helping to establish Ford’s first Silicon Valley laboratory in 2012. He held leadership positions around the word in the U.S., Germany and the UK.